[B]ehold, a man came up to him, saying, “Teacher, what good deed must I do to have eternal life?” And he said to him, “Why do you ask me about what is good? There is only one who is good. If you would enter life, keep the commandments.” He said to him, “Which ones?” And Jesus said, “You shall not murder, You shall not commit adultery, You shall not steal, You shall not bear false witness, Honor your father and mother, and, You shall love your neighbor as yourself.” The young man said to him, “All these I have kept. What do I still lack?” Jesus said to him, “If you would be perfect, go, sell what you possess and give to the poor, and you will have treasure in heaven; and come, follow me.” When the young man heard this he went away sorrowful, for he had great possessions (Matthew 19:16–22). It’s easy to distance ourselves from this story. After all, we’re part of “the 99 percent,” right? We’re not really rich. Many of us have trouble meeting our bills on a day-to-day basis. But consider this: The money you spend on a book (like this one) is more than the daily income of more than a third of the world’s population. Still feel like a 99-percenter? Ultimately, it’s not about what we have or don’t have. We can be rich and hold our riches loosely. Likewise, one can be genuinely poor and still greedy. It’s all about our incessant need to have. Are we willing to put everything we have at Jesus’ disposal—or, if called upon like the rich young ruler, dispose of it altogether—in order to follow him the way he calls us to? I think we know the answer, if we’re honest. In fact, I think the real “one-percenters” are those who can answer “yes” to that last question—and mean it. And yet, Jesus calls every one of us to lay down our possessions—or more specifically, our possessing. As Americans, we are all too accustomed to spending beyond our means. As Christians, we are called to give beyond our means (2 Corinthians 8:3). What do we hang on to more than Jesus—and for that matter, what do we consider to be more important than the people he puts in front of us to serve? Whatever that is, it’s time to release our grips on those things. Then Peter said in reply, “See, we have left everything and followed you. What then will we have?” Jesus said to them, “Truly, I say to you, in the new world, when the Son of Man will sit on his glorious throne, you who have followed me will also sit on twelve thrones, judging the twelve tribes of Israel. And everyone who has left houses or brothers or sisters or father or mother or children or lands, for my name’s sake, will receive a hundredfold and will inherit eternal life” (Matthew 19:27–29). We do not serve a God of either/or, but a God of both/and—if we’re willing to surrender all of our tiny little kingdoms and properties and belongings to him. God must rule over the things he’s given us, and be the one who determines how they’re used. As John Piper says in Desiring God, “It is better to love than to live in luxury!” Are we willing to put that to the test? I can’t tell you what to do here. But if you’re honest with yourself and willing to let God address this, you’re going to come up with things to lay down in a hurry. So that’s your assignment. Spend time together, just you and God. Ask him to point out those things that you’ve let possess you. Scream and cry about having to let them go, if you must, but resolve to follow Jesus, no matter what the temporary cost. Trust that he will provide what you truly need. And remember: He may not be providing it only for you. I’ve worked on (and still am working on) too many of these to list out here, but trust me, there’s probably a minibook for any counseling situation you or someone you know is facing. And you’ll likely recognize some of the authors (Paul David Tripp, David Powlison, Ed Welch, etc.) and organizations involved (CCEF, Joni and Friends, etc.). So dig in and find out what works for you. . . . Various authors. New Growth Press minibooks. Usually 24p., $4.99 or less apiece (5-packs, full displays, and subscriptions also available), New Growth Press. These minibook titles address a wide range of everyday issues like marriage, parenting, mental health, and much more. Each minibook is small enough for the average reader to finish in less than thirty minutes and filled with the practical Gospel-centered counsel that pastors, counselors, and believers around the world have come to trust. Minibook displays are frequently used by churches, counseling ministries, and ministry organizations to quickly provide counsel that meets people where they are. I was recently walking around a wildlife area of Colorado where informative plaques abounded. One plaque in particular caught my eye, highlighting the families who’d formerly owned ranches in this area in the late nineteenth/early twentieth centuries. It got me thinking about all the different ways we come up with to “historically” immortalize ordinary people after they’re gone (and by “ordinary,” I mean people we wouldn’t give a second thought to if they were standing in front of us, because they’d be roughly as accomplished or smart or likable as us). But because they’re no longer with us, we’ve found ways to keep them alive—resurrect the memory of them, if you will. I think, at least on some unconscious level, we do it because we inwardly recognize our own desire to keep ourselves alive a little longer, beyond our own time on earth. We believe, or at least hope, that people will remember us after we’re gone. We want our lives to have mattered to someone, to have been significant in some way. Far too many of us among the living don’t feel that. You might be feeling that right now. This is also apparent in the reputations we try to keep—whether it’s a good name, or at least in a name bad enough that people will remember it. We want to be loved or respected or at least feared, even if it’s only really a persona with our name on it rather something that represents who we really are. Eventually, if we’re not careful, those reputations will own us, rather than the reverse. As soon as we begin to rest in our own accomplishments and others’ perceptions of them, we drift away from the Spirit. Spend some time with almost any long-established church or denomination if you need further proof of this. Anything we’ve done apart from God is . . . apart from God. To lay down your reputation is to experience the life of Christ (turn one chapter earlier to Philippians 2 for a fuller illustration). So lay it down, and let Christ be the one to raise you back up. What are the “plaques” in your life, whether they’re physical or not? What do you point to as evidence of your own goodness or righteousness? Put another way, what do you find yourself defending other than God—perhaps even in the midst of “defending God”? Where do you need to lay down your reputation? Submit that to God in prayer right now. Resolve not to defend yourself, but to allow God to be your defender. Then, get up from your prayer and start walking it out. Another one for all you commentary lovers out there. . . .
Stanley E. Porter & Ron C. Fay, eds. The Gospel of John in Modern Interpretation. 256p., $25.99, Kregel Academic. 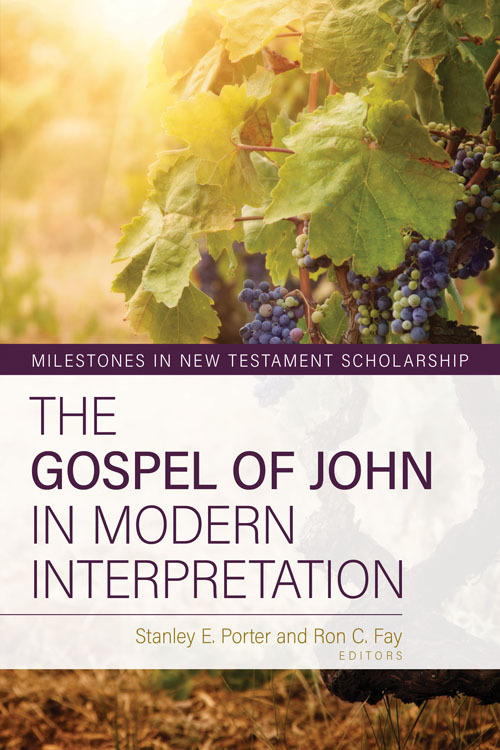 The Gospel of John in Modern Interpretation provides a unique look at the lives and work of eight interpreters who have significantly influenced Johannine studies over the last two centuries. The chapters contain short biographical sketches of the scholars that illuminate their personal and academic lives, followed by summaries and evaluations of their major works, and concluding with an analysis of the ongoing relevance of their work in contemporary Johannine scholarship. Key thinkers surveyed include C. H. Dodd, Rudolph Bultmann, Raymond Brown, Leon Morris, and R. Alan Culpepper. An introduction and conclusion by general editors Stanley Porter and Ron Fay trace the development of Johannine scholarship from F. C. Baur to the present, and examine how these eight scholars’ contributions to Johannine studies have shaped the field. Anyone interested in the recent history of the study of John will find this volume indispensable. Our strength—or rather, our reliance upon it—is still pride. Therefore, it must be broken. Watchman Nee, in his book Changed into His Likeness, put it this way, “The characteristic of those who truly know God is that they have no faith in their own competence, no reliance upon themselves.” It’s when we reach this point that we’re finally and truly useful to God. Even much of the strength we think we have comes from our need to compare ourselves to others. We may be correct in thinking we’re much more gifted than others in a certain area or areas. But what’s that in comparison to God? Before him, even our strength is weakness. Until we’re willing to acknowledge this, even what little strength we have is useless to him. b) Abraham tries to do things his own way, and fails miserably. c) Abraham finally “gets it,” relents, and allows God to accomplish his will in his way, and with his timing. d) Abraham himself begins to truly reflect God’s will. e) God brings Abraham to a new level—and a new test. Repeat steps b.–e. a) God promises Abraham a son (Genesis 15). b) God doesn’t appear to be doing anything, so Sarah pushes Abraham to take matters into his own hands. “Here, sleep with my servant Hagar; we’ll have a son that way.” The result: A ton of family contentiousness (Genesis 16)—as well as millennia of religious contentiousness, via the birth of Ishmael, the forefather of Islam. c) God waits thirteen years—until Ishmael’s reached adulthood and neither Abraham nor Sarah have the human ability to bear any more children—and repeats his promise to Abraham (Genesis 17–18). d) Oh, and first Abraham also has to pray for an entire kingdom’s worth of barren women, because he hadn’t managed to break that nasty habit of calling Sarah his sister whenever another king was around—yet another trust issue for Abraham. Imagine how it must have felt to pray for the barrenness of those women, in light of the years of waiting Abraham’s already had. But he does. And then, God delivers on his promise (Genesis 20:17–21:1). e) Years later, God commands Abraham to sacrifice Isaac—the very same son God had promised, and given. But now, Abraham doesn’t flinch. God spares Isaac, and makes a great nation of him and his offspring (Genesis 22). We often want to do God’s work, but nearly as often we don’t want to do it God’s way. We rationalize why we shouldn’t wait, or why some other way would be so much more “sensible” or “efficient.” But unless what we do starts with God, it’s worth nothing. We must not will to do, but will to receive—and then share what God gives us. When we lay down our strength, we give God permission to exercise his strength. We give birth to Isaacs instead of Ishmaels. We grow fruit that lasts, not dead branches to be burned. God does something so much greater than we ever could have imagined that we have no choice but to praise him—and rejoice in our weakness that gave him the opportunity to work. When you look at the results instead of the circumstances, what’s really the easier and more rewarding route—to give birth to an Ishmael or to an Isaac? Think about it. What right now has you wondering, “Why hasn’t this happened yet?” If your impatience were to get the better of you, what would you try to do on your own strength? What would your Ishmael look like? What small successes and evidences of God’s presence in your life can you focus on instead, as you wait for “this” to happen? Just in time for the Easter season . . . and any season where you desire to bring more meaning into the Lord’s Supper . . .
David Warnick. Is There More? Resurrecting Communion. 160p., $13.99, Deep River Books. The Bible speaks of the first believers breaking bread with “gladness,” and we often speak of “celebrating communion.” Yet does this reflect our actual experience? Is There More? takes the reader on a discovery to remove superficiality from the way we engage in the Lord’s Supper and recover the elements that make it a vital faith encounter. Warnick’s book examines various aspects of communion, how we practice it, and how we could practice it in order to make it a truly meaningful aspect of worship. . . .
Is there more to communion than what we currently observe? Indeed, there is, and this fresh approach to the Lord’s Supper can ignite hearts with passion and transform the act of communion. David Warnick’s biblically sound exposition takes us to a deeper level of understanding and fellowship with our Lord Jesus. We’ve spent a lot of time in past entries addressing our feelings toward those who’ve opposed and hurt us. Therefore we’re going start this week, and this section, by widening our net ever-so-slightly to include one more enemy—you. All of us have been God’s enemies, and I’m not just talking in a positional, “before we were born again” sense. I’m talking experientially. Like earlier today. Like maybe even right now. We habitually assert our “in-dependence from” God. Every time we take matters into our own hands, we very deliberately—and however unwittingly—separate ourselves from God and set up our own little kingdoms. For all practical purposes, we’re declaring ourselves his enemies in those matters. Our very actions declare, “God, I just don’t trust you.” We might well come slinking back in repentance later, with spiritual hat in hand . . . but that’s later. I don’t say this with the intention of beating anyone up; nonetheless, we operate in this manner a whole lot more than we’re willing to admit. And yet Jesus continues to love us even when we oppose him, directly or indirectly. This is why he can so authoritatively command us, “Love your enemies, and pray for them who persecute you.” He not only lived this out during his time on earth, but has been confronting our opposition since the garden of Eden—and since his resurrection as well. Think about how you feel when a loved one is hurt or threatened. Jesus feels that way about each of us, especially those within his church. And he’s just as offended, if not more so, when those who seek to hurt his people are those within the church. Our offenses might not be as egregious as the ones committed by those people—you know, the ones you just thought of instead of yourself—but we’re not innocent here either. We too oppose Jesus far too often. We assert our own identity apart from him because, well again, we just don’t trust him. And by the same token, we withhold love from others because we don’t trust them either—because we believe our offerings will be rejected or discarded. Jesus says: That’s not the point. The point is: Do you trust me enough to lay down your independence and follow me—and therefore, obey me? We need to love the enemy known as us, just as Jesus does. After all, who needs love more than someone who clearly doesn’t have any love? One more thing: Laying down our independence isn’t only about letting Jesus in, but about letting others in—to run the risk of incurring enemies, to run the risk of even good people opposing your good plans. And then, love them anyway. The people in front of Jesus weren’t obstacles in his path—they were his path. We’re called to follow that path. You were never in this alone. You never will be, no matter how much you choose to live as if you were. So lay down your independence, let go of your own little kingdom, and become the person Jesus calls you to be. Who are your “enemies” right now? Broaden your definition as far as you need to—or, point the finger back at yourself. Don’t only focus on those who’ve hurt you—hopefully, you’ve already dealt with a lot of that—or those who obviously oppose the gospel. Who’s “in your way” right now? Who’s standing between you and what you want? How is Jesus calling you to respond to them in love, instead of responding to how they’re opposing you? Confess your insistence on your own way—the way you’ve treated God like an enemy—and ask him to help you release it. Ask to receive his love and for the ability to extend it to others, particularly those you’ve just named. Then, take the steps you need to express that love tangibly—again, possibly to yourself as well. And trust God to be there when you do.